Michael Farenas shows a heart of the Filipino champion after he demolished the undefeated Olympian Mark Davis of USA via TKO. The fight is for the IBF title eliminator. In the first round Farenas scores a left hook that cause an early cut on the right eye of Mark Davis. The Filipino throws bombs and continue to target the cut. In the second to fourth round Farenas continue his relentless attack and Davis was nothing to give. Farenas over power the undefeated fighter. Then in the fifth round Farenas looks unstoppable and he almost knockdown Mark Davis in the last second. David was saved by the bell. In the 6th and 7th round Farenas looks like saving his energy. 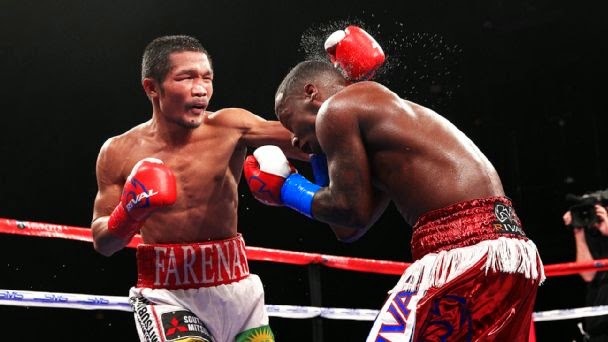 The fight was discreet but still Farenas wins the round. Also the corner said to Farenas "Balik ka na lang pag nakalimutan nya na" it means that Farenas is looking to bait Mark Davis to attack then he will throw a big punch. Then in the 8th round the bait was eaten by Mark Davis, Farenas connects a big left hook that cause Davis stumble back and the referee stops the fight. A big win for Farenas. Farenas now is the no. 2 contender and he is looking forward for the IBF title shot. Pinoy Pride!